Ranger Rick. Reston: National Wildlife Federation, August 2010. Print. Ranger Rick. Reston: National Wildlife Federation, September 2010. Print. 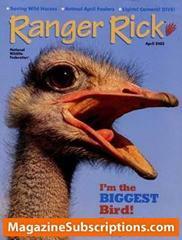 Ranger Rick is an educational magazine for boys and girls that is published by the National Wildlife Federation focusing on all things nature. The target audience for this magazine is boys and girls ages seven and up. I think this is a great addition to any classroom or library collection. Tweens are very conscious of teh world around them so this is a good time to get them thinking about the environment adn their impact on it. This magazine could be a tool in helping tweens develop habbits that will last a lifetime. The photography in this magzine is phenonmenal, and shows different animals in their natural habitat. Even though this magazine was originally published in 1967, the issues that it focuses on are more important than ever. Concepts like global warming, natural disaster, and natural resources are terms that many kids hear on a regular basis these days, and ranger Rick is a good introductory magazine to help explain some of these issues. There are many learning activities that could be derived from this magazine. Teachers could use some of the articles as introductions to science curriculum. One of the issues I reviewed had an article entitled "How to Green Your Parents". Kids could use the tips given in the article to go home and come up with ideas as to how their families could be more environmentally friendly. They could then come back to class and do a poster board explaining how they will implement this plan. This book will appeal to kids who are community oriented and are looking for ideas to get involved. Kids who love animals will be drawn in by the eye catching photos, but will stay to read the articles and play the games!